Ânes Sans Frontières Circuit Âne 6 jours Sur la chaîne des Appenninos. Casale Le Crete Tagliacozzo. We have four donkeys, Eva, Nino, Sophie and Toffee! We organise walks with them on the Cammino dei Briganti, childrens excursions (riding) and independent, customised treks, from 3-10 day, with or without guide. 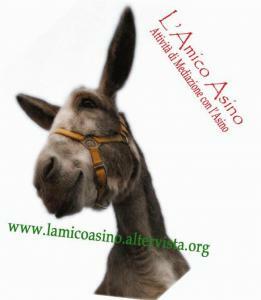 Donkey Trekking in Sila Cosenza. Le Vie della Pera tour operator. Trekking with donkeys in the Greek Sila along a mule track surrounded by chestnut woods. The route starts from the main square of Longobucco, a village near Cosenza on the mountains, and takes in breathtaking views of the mountains and the Ionian Sea. This guided trekking excursion lasts for 3 or 4 hours and is suitable for children. Recanati, Macerata. Ca’di Luna è una piccola proprietà contadina e asineria, sotto il colle dell’infinito di Leopardi. Terapia assistita con l’asino, escursioni con asini, campi estivi, esplorare il bosco tra animali selvatici e folletti e coltivare l’orto e laboratori artistici e culturali. Aassisted therapy, excursions, camping and workshops. Happy Donkey Tours Treks from 3 days to 6 days in the Casentino forests and mountains, the lakes of northern Italy, Mercantour national park in the French Alps and Corsica. Professional guides will lead you and your donkeys safely through Italy’s breathtaking scenery, giving you a taste of the country’s cuisine and inviting you to explore its hidden locations. The Donkey on the Abbot’s Way Pontremoli. Treks along the historic paths of the Abbot’s Way, for families, communities, children and pilgrims. Enjoy beautiful landscapes, green hills and wonderful cooking. Short one day treks or longer walks for several days.